Are you familiar with the Paleo Diet? “Paleo” means older or ancient, especially relating to the geological past. 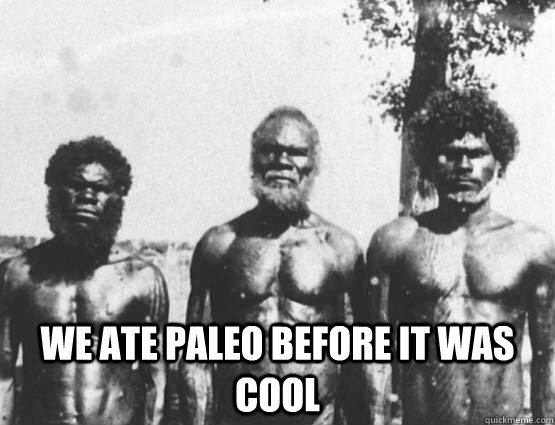 So the Paleo Diet takes us back to the concepts of Stone Age food consumption, mimicking a hunter-gatherer diet. Think like a caveman; if you could hunt or find it, it’s probably an acceptable Paleo food. The “optimal diet is the one to which we are genetically adapted,” according to the Paleo Diet main website. Foods that were developed under agrarian society, like grains, dairy, and legumes, are a no-go. The purpose of the diet is ultimately to help prevent and reduce risk of diseases that are considered illnesses “of modern civilization” as well as contribute to weight loss and improve overall energy. Whether you’d like to give this diet a try, you’re already a Paleo-follower, or you’re just looking for some healthy dishes to bring in the new season, here are 7 recipes that follow this diet’s principles and will get you in a spring mood! This dish replaces pasta noodles with spaghetti squash and is bursting with the flavors of spring herbs. Preheat the oven to 425 degrees. Cut spaghetti squash in half lengthways, and remove the seeds and excess threads. Place cut side down on a baking sheet, and cook for 20-25 minutes. While that’s baking, place a large skillet over medium heat. Add a tablespoon of fat then minced garlic to the skillet. Once you start smelling the garlic fragrance, add the diced onion. When the onion becomes translucent, add the vegetable broth and coconut milk. Take it up a notch by adding your seasonings then the diced chicken sausage and spinach. Cover and simmer for 3-5 minutes. Once the chicken sausage is completely cooked, de-thread the spaghetti squash with a fork and add them directly to the chicken sausage mixture. Combine using tongs. Watermelon is high in potassium, a main characteristic of foods the Paleo Diet encourages. The combination of watermelon with other fresh ingredients and topped with a delicious apple cider vinaigrette makes this an invigorating salad option for a warm spring day! Whisk together all vinaigrette ingredients in a small bowl and set aside. Cut the onion lengthways into thin slices. Combine the onion, chopped watermelon, and chopped tomatoes in a medium-sized bowl and toss with the vinaigrette. Intensify the flavors by allowing these ingredients to sit for about a half hour. Prior to serving, garnish with mint leaves and pieced goat cheese. The vinaigrette causes the mint leaves to wilt and thins the goat cheese, which is why they’re added at the very end. This is a super easy Paleo-breakfast option packed with Omega-3s, and the prime season for avocados (although available year-round) just happens to be early spring! Preheat oven to 425 degrees. Cut the avocados in half and remove pit. Scoop out about two tablespoons of flesh from the avocado center – just enough so the egg will fit securely. Place avocados open side up in a small baking dish, ensuring it is a snug fit to avoid them toppling over. Crack an egg into each avocado half, trying to crack the yolk in first then letting the egg whites spill in to fill the rest of the shell. Bake for 15-20 minutes (cook time will depend on the size of eggs and avocados). Remove from oven, and season with peppers and chives or any garnish of your choice. This healthy chicken dish adorned with a delectable strawberry sauce is the perfect recipe for firing up the grill for the first time this spring! Season chicken with salt and pepper and cook on grill or grill pan for approximately 5 minutes per side until done (timing varies depending on thickness). If using a grill pan, first grease the pan with about ½ tablespoon of coconut oil. While the chicken is cooking, melt coconut oil in a small skillet over medium heat. Add the strawberries, basil, mint, and juice, and simmer for about 10 minutes until the sauce is reduced and thickens. Spoon the sauce over the cooked chicken. Use additional basil and mint to garnish for a final touch. Fresh asparagus is not only a prominent spring veggie choice, it is also a great source of fiber and packed with antioxidants. Along with the sautéed asparagus, the combination of smoky bacon and caramelized onion makes this one flavorful, savory side dish! Cut about half an inch off the asparagus stems then cut asparagus in 2-inch long pieces, separating the tips for shorter cooking time. Brown bacon in a non-stick skillet; remove and drain on paper towels. Add the onion to the remaining grease and sauté until they begin to caramelize. Add the 2-inch stem pieces (don’t add the tips just yet). Sauté for 2-3 minutes until stems are crisp-tender. Now add the tip pieces and sauté until they are also crisp-tender. Pour the asparagus and onions into a serving dish and top with the bacon bits. A healthy twist to a simple noodle and sauce dish, this Mediterranean-inspired pasta makes us think of spring with all the light, vibrant colors! Slice zucchini using a spiral slicer (or a vegetable peeler if you don’t have a spiral slicer). Lightly salt zucchini and drain for about 20 minutes (to keep your sauce from becoming watery). In the meantime, on a cutting board make a paste with the garlic, 1 tablespoon of the capers, and red pepper flakes. Finely chop the ingredients then work with the flat side of the knife to move the ingredients back and forth until the paste forms. Transfer the paste to a mixing bowl, and add the remaining capers, olive oil, and tomatoes. Add the butter to a skillet over medium-high heat and sauté the zucchini for 1-3 minutes. Take care not to overcook. Add the zucchini to the sauce and toss together. Stir in fresh basil. 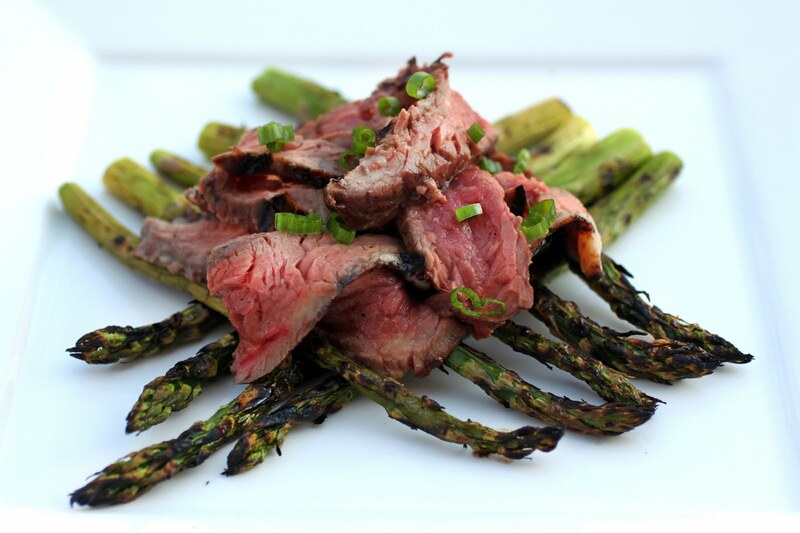 Another great opportunity to use the grill, this luscious steak infused with a fresh, citrus marinade is so easy to prepare and supplies plenty of protein to support a Paleo diet. Combine orange and lime juices in a small bowl then add garlic to the marinade. Next, add brown mustard and blush vinegar and whisk. Put the steak in a gallon-sized Ziploc bag along with the marinade, and refrigerate for 30 minutes to an hour. Preheat the grill on medium-heat then grill steak for 6-7 minutes per side. An excellent way to serve is over grilled asparagus or a heap of spring greens.